Your concern for the future is to determine whether your contaminated floors can be safely sterilized so that flood water contaminants and mold have no chance of spreading germs to your family. In general, solid vinyl and ceramic tile or stone flooring on a concrete slab may be cleaned in place. Loose tiles may be replaced if the floor has not been soaked. If water has seeped under sheet flooring, remove the entire sheet. Sheet vinyl with paper backing is at risk of holding moisture and may support mold growth, so it may need to be replaced if discoloration or loosening occurs. If there is wood subflooring, it may swell and buckle or delaminate. If so, removal of flooring may be needed to dry and replace damaged subflooring. After cleaning, using a dehumidifier will greatly speed the drying process to avoid mold growth and allow faster restoration. Once the flooring is removed, clean the slab or exposed subfloor first to remove soil with a non-phosphate all-purpose cleaner. Then disinfect it as a second step because flood water is contaminated with sewage. With concrete floors, removal isn’t necessary but disinfection is. Carpets and floors may be contaminated by mud, silt, sewage, and mold. Carpets and paper-backed flooring in most cases should be removed and replaced. Pull up all saturated carpeting and rugs, roll them up and drag them outdoors; discard and replace wet foam pads. If only small areas of carpet got wet from leaks, pull up and prop the wet carpet to dry. Cutaway wet padding. To discourage mildew and odors, rinse the backing with a solution of 2 tablespoons of bleach to 1 gallon of water; disinfect the slab or subfloor. The first step is to get valuable rugs, not contaminated by hazardous chemicals, dry and keep them dry. Then work a low-sudsing, disinfecting carpet-cleaning product deep into soiled spots with a carpet shampooer or broom. Rinse and extract water with a steam cleaner, if possible. If odors or mildew formed, consider a sanitizing rinse solution of one part of 3 percent hydrogen peroxide to five parts water or two tablespoons bleach to one gallon of water. Don’t use bleach on wool carpets. As for your expensive floor, you need to determine the reason for the damage. 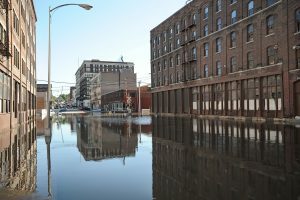 The feasibility of repairing the water damage depends on several factors, including the type of wood and the extent of the damage. Then, if there are large gaps in the floor or the boards have begun to warp, you will need to remove and replace the affected areas. You might want to remove a board every few feet to reduce buckling caused by swelling. When warping compromises any structural functions, however, replacing the wood may be your only option. When laminated floorboard gets wet, the top layer can separate, fray at the edges or bubble on the surface.. Engineered wood and laminate flooring that swells or ‘delaminates’ from flooding might need to be replaced. After the material dries completely, try to glue the layers back with construction adhesive or carpenter’s glue as a last shot. A flooded home is scary, frustrating and even dangerous. If you have had a flood, you will need more than a cleaning crew or a general contractor, you need a team to act as your advocate with through all the steps of the process. Lessen your stress by contracting with a central resource familiar with insurance companies, agents, adjusters, and all the many others involved in a loss. In southern Maryland, you can rely on Regional Property Group for all of your water damage needs.